Studying the anatomy of human brain and other organs is not going to be fun for everyone. But if you are planning to pursue a career as a health or medical professional, you will have to master this science. 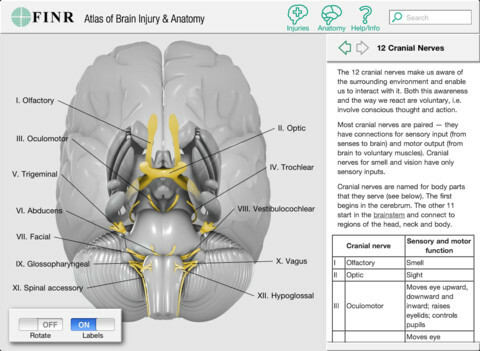 FINR Brain Atlas is one of many apps you can use to get a better understanding for the human brain. This app provides you with a 3D model of the brain and its common injuries. FINR Brain Atlas covers the functions of various parts of the brain and the injuries related to each area. You can interact with the brain model by zooming in/out, panning, and swiping. The app has pop-up labels and plenty of regions for you to explore. You can turn labels on and off. Rotation can be turned on and off as well. 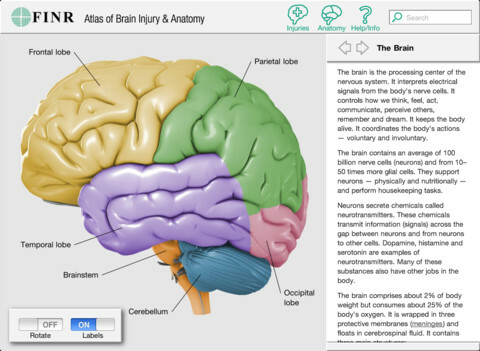 FINR Brain Atlas is much cheaper than many other anatomy apps for iPad. This could prove useful if you are studying the human brain or need to look up information on its injuries.